Saturday to Sunday, 10am-5pm each day. Reserve your spot by contacting me ASAP as weekends fill up fast! 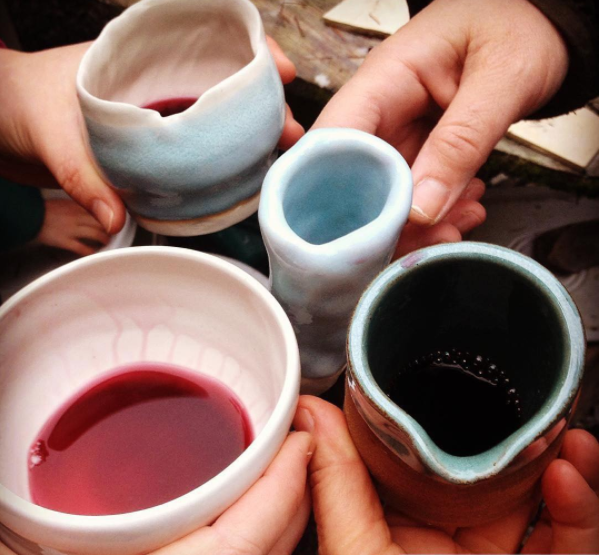 Adult weekend workshops cover a wide variety of techniques for working with clay, including hand building and throwing and surface decoration techniques that include carving, painting with underglaze, and appliqué. Suitable for beginners to advanced students, I spend a lot of individual time with each student based on their skills and what they want to learn and build. Students have built everything from vases and piggy banks to sets of plates and teapots. Many students return again and again, enhancing and building their skills each workshop they attend. Standard workshops are Saturday and Sunday, 10am - 5pm. I occasionally offer multi-day intensive workshops. Final drying, finishing, bisquing, and glazing of all student work happens in the studio and is ready for pick up (or transport as arranged) by students about 3 weeks after the class, depending on the season and studio firing schedule. I announce workshop dates on my website, Facebook, Instagram, and via my email list. Classes fill fast, so if you are interested please get in touch. COST: $295 Includes all materials and firings (bisque and glaze). $200 downpayment required for registration to hold your place. $100 non-refundable due to small class size and cost of pre-ordering materials. These classes are for absolute beginners through advanced. I have many students who take weekend workshops many times, building their skills from absolute beginners to advanced ceramics artists, developing their own style and artistic language over time. Hand building, as I have found for myself, can be even more creative than throwing. I introduce many hand building skills. I will have slabs of clay ready for you to work with. I will show you quick and easy ways of making mugs to teapots. If you have never been on the wheel before I will get you throwing, working hands-on (literally) with you to throw pots. If you have been on the wheel before, I will watch you throw and trouble shoot everything from your ergonomics to your pace. I am happy to demo and teach anything you wish. We will be imprinting clay, carving and painting. I will give lots of creative decorating and glazing demos. I have many coloured slips and underglazes to finish your forms with, and will instruct on how to use them. I accept E-Transfer and credit cards. *PLEASE CONTACT ME AT 250-538-7021 WITH ANY QUESTIONS. My workshops for children are designed to be fun and encourage freedom of expression. We learn to build pots by hand and get messy on the wheel. We also paint pieces with underglaze. Final drying, finishing, bisquing, and glazing of all student work happens in the studio and is ready for pick up (or transport as arranged) about 3 weeks after the class, depending on the season and studio firing schedule. Teaching is a close second in my heart to working with clay myself. I am constantly amazed by what my students created and the creativity and openness they bring to class. I teach workshops for both adults and children throughout the year. If you'd like to receive notification of upcoming workshops, please sign up for my email list and follow me on Facebook and Instagram where I announce upcoming dates as well as last-minute open spots due to cancellations. I am also available to teach private workshops upon request in my studio on Salt Spring Island, time permitting.